The game design program at UC Santa Cruz will be well represented at the 2016 IndieCade Festival, which celebrates the best independent games of the year. Four games developed by UC Santa Cruz students have been announced as official nominees for IndieCade awards, and UCSC students will also take part in a panel on “Games as Protest” during IndieXchange, a series of workshops and sessions for developers that precedes the festival. “We appear to have the strongest IndieCade presence of any university this year,” said Noah Wardrip-Fruin, professor of computational media at UC Santa Cruz. For the “Games as Protest” panel, Mark Biundo, Jason Brisson, and possibly other members of their team will discuss their work on a game called Project Perfect Citizen, which won the Grand Prize at the 2016 Sammy Awards, the annual awards ceremony hosted by the UCSC Center for Games and Playable Media for students enrolled in the game design program. Project Perfect Citizen is an interactive narrative experience that explores issues of privacy, security, and government surveillance in the modern digital age. The game puts the player in the shoes of a government surveillance officer who is responsible for hunting down cybercriminals and has access to the digital lives of citizens, creating ethical quandaries that force the player to grapple with difficult issues. “We tried to create realistic characters that the player can empathize with, and scenarios where it’s not black and white whether this person is doing something the government should be concerned with. The feedback has been overwhelmingly positive,” said Biundo, one of seven undergraduates in the game design program who worked on the game, along with two art students and lead writer Brisson, a legal studies student. The nominees for IndieCade awards this year include the UCSC games Séance, Shackle, Bad News, and Threadsteading. Séance is an interactive installation about communicating with the dead, created by Mitch Mastroni and Kelsey Coffman, both undergraduates in the computer game design program. It earned second place in the Sammy Awards Grand Prize competition. 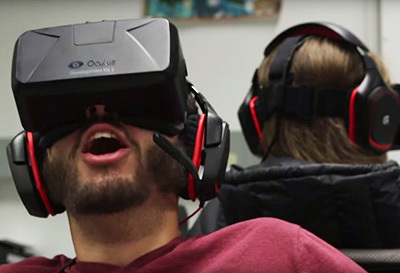 Shackle is a two-person cooperative horror game for the Oculus Rift virtual reality system, in which players find themselves trapped on opposite sides of a haunted room. It was created by a team of nine undergraduates: Hayden Platt, Lauren Cunningham, Dara Diba, Ryan Connors, Jarrett van dan Bergh, Silivia Ordonez, Joey Schutz, Fangzheng Han, and Tommy Schutz. Bad News, developed by graduate students Ben Samuel, James Ryan, and Adam Summerville, uses artificial intelligence to simulate the history of a fictional small town and combines gameplay with improvisational theater. The player must accomplish a task by interacting with townspeople in a live performance, with actors playing the townspeople and using the simulation to guide their improvisations. Graduate student April Grow was a core member of the team that developed Threadsteading at Disney Research in Pittsburgh, where she was an intern. UCSC alumna Gillian Smith was also on the team, and Grow and Smith will both be representing the game at IndieCade. Threadsteading is a two-player game played entirely on a modified quilting machine, and each round of the game results in a permanent physical artifact: a quilt. Although computation underlies the experience in all of these games, in several of them the players interact not with computer screens but with objects and people in the physical world. According to Jim Whitehead, professor of computational media, this is part of a growing trend known as “alternate controller” (alt.ctrl) games. This is the sixth year in a row that games created by UC Santa Cruz students have been among the official nominees at IndieCade. The interactive fiction piece Ice-Bound, created by graduate students Aaron Reed and Jacob Garbe, won the Story/World Design Award at the 2014 IndieCade Festival. Beyond IndieCade, student games from UC Santa Cruz are being recognized in other settings as well. 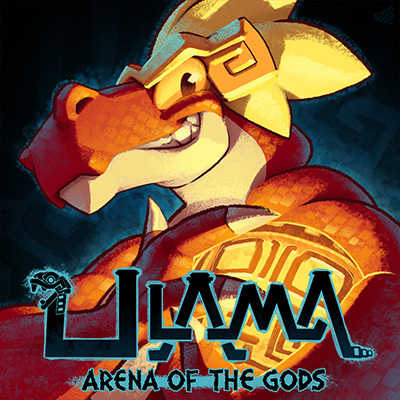 Ulama: Arena of the Gods, created by a team of graduate students in the Games and Playable Media master’s program (Pedro Cori, Alexander Formoso, and Cong Liu), was “greenlit” by the Steam community in just 15 days. Steam Greenlight, part of Valve’s Steam digital distribution platform, is a way for users to help choose which games are added to the service. Earlier this year, the same team (Trainwreck Games) won a game design competition at the Electronics Entertainment Expo (E3).